Despite the fact that Nick and I are busy settling into our new life in Vancouver, I can’t help but reflect on how fantastic our time New York was. Eighteen incredible months filled with yellow cab rides, walks around Central Park, dinners in SoHo, brunches in the East Village, roof tops drinks in Williamsburg and a whole lot more! I will certainly miss the perks of living in NYC: the pace, the people and above all the copious amounts of great food. 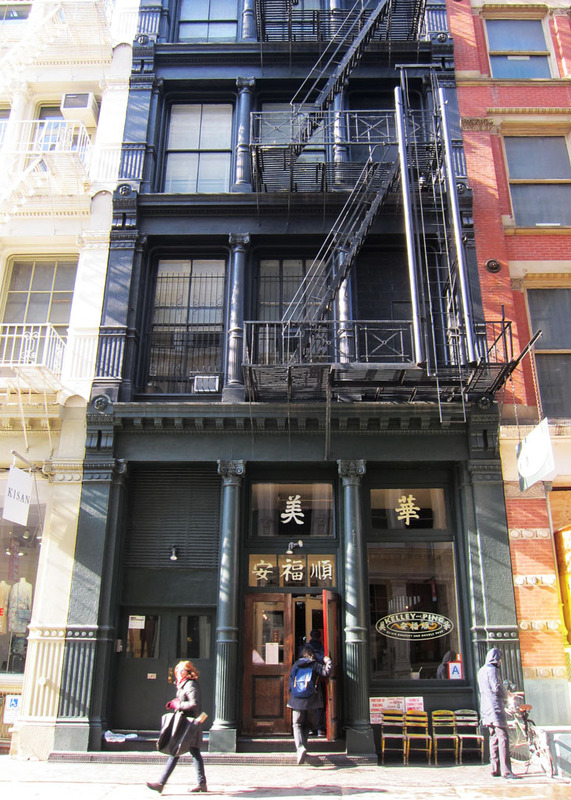 Since I’m sitting here thinking about NYC’s food scene, I thought perhaps I would write about one of my all time favourite SoHo restaurants, Kelley and Ping. Located in the cast iron district of SoHo, Kelley and Ping serves up some seriously tasty and satisfying Asian noodle dishes, curries, soups and salads. The meals are so good that when we lived in New York, I was constantly coming up with excuses to be around Greene Street come lunch time so I could grab a bowl. My favourite dish is the Pad-see-ew. 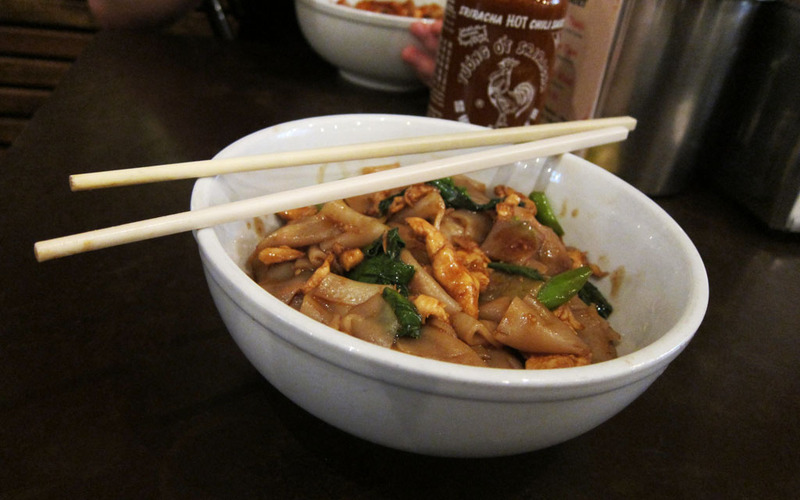 Fresh, thick rice noodles with chunks of chicken, a mix of green vegetables and dark soy sauce. Simple but oh so good. At lunch, meals are ordered casually canteen style, so prices are a little lower than in the evening when the restaurant shifts into table service mode. Regardless of the time of day though, the menu is reliably good and influenced by the bold and spicy flavours of classic Asian cuisine. Friendly staff, well priced meals, a surprisingly spacious layout and the option to sit in or take out makes Kelley and Ping the perfect spot to stop for a quick bite to eat, when you find yourself walking around SoHo (most likely shopping up a storm). The meals at this Lower East Side brunch spot, just south of Houston, have people regularly lining up around the block on weekend mornings. For good reason too, it must be said. Clinton Street Baking Co. & Restaurant has hands down, the best pancakes in all of New York City! Served with a pot of warm maple butter, which is outrageously good and a choice of wild Maine blueberries, banana and walnut or chocolate chunks, Clinton Street’s pancakes are fluffy and the perfect balance of sweet and savoury. Don’t believe me? Try them for yourself. There are a whole heap of other brunch options, which are equally as delicious and include brioche french toast and eggs benedict, as well as Southern dishes like buttermilk biscuit sandwiches. 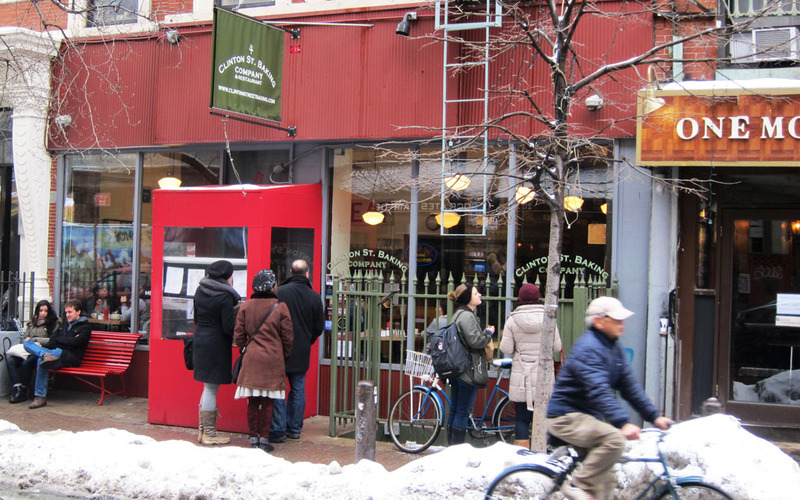 If you’re planning to visit Clinton Street Bakery Co. on the weekend, then prepare yourself for an inevitable wait, which at times can be close to two hours. Luckily, you won’t have to wait out on the street until your table is ready as the host will take down your name and number, and text/call when your table is ready. Although the wait can be lengthy, it’s well worth it I assure you. To beat the crowd and if your time allows I suggest popping in during the week. 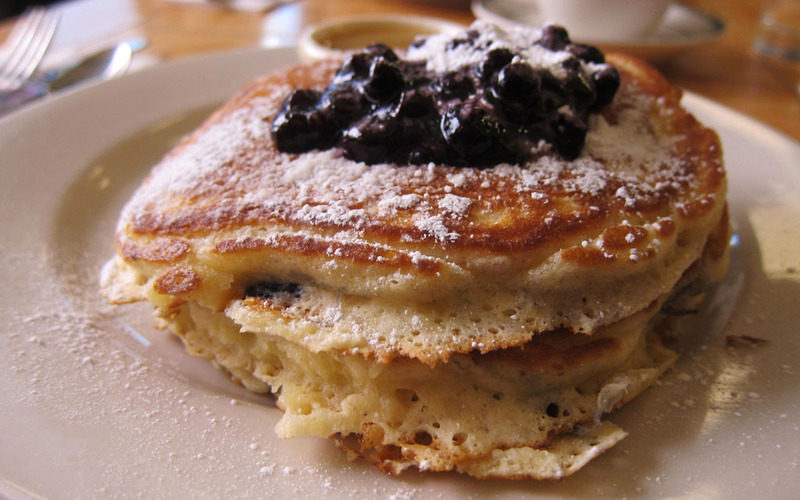 Alternatively, avoid the crazy brunch lines by ordering a stack of blueberry pancakes for dinner. Who said you can’t have pancakes for dinner? While there is a cash only policy at breakfast, credit cards are accepted at dinner. 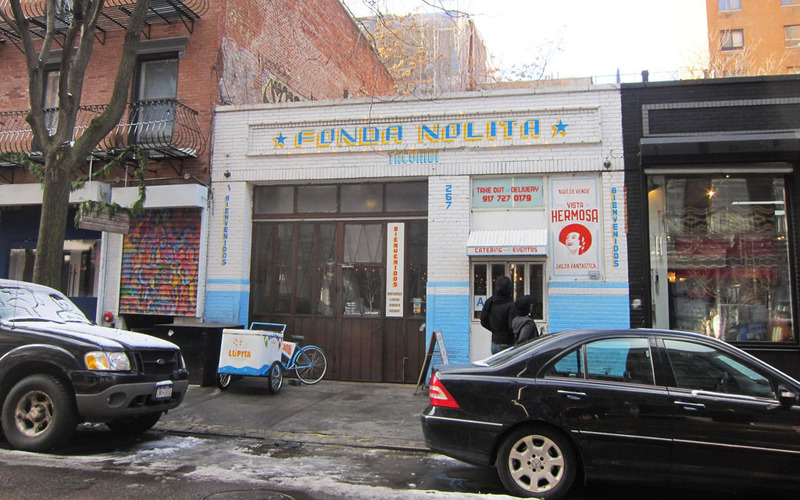 If you’re looking for a fun place to grab a bite to eat as well as a craving for Mexican, look no further than Tacombi – Fonda Nolita. Despite its seemingly rundown appearance, this casual Mexican eatery serves up small but seriously tasty tacos. Braised beef, pork belly, crispy fish and roasted chicken just to name a few. As soon as you walk through the door you feel as if you’ve walked straight into an outdoor fiesta. The string lights, palm trees and fold up tables and chairs make you feel as if you’re sitting at a roadside taco stand in Mexico rather than at a popular Manhattan restaurant. 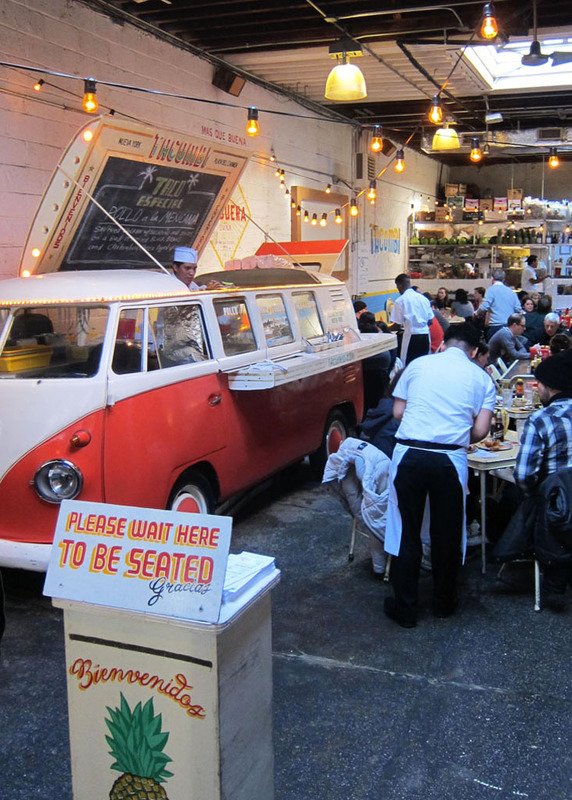 There’s even a retro red VW van turned kitchen parked at the side, which dishes out tacos for breakfast and lunch then switches to a plating station at dinner. 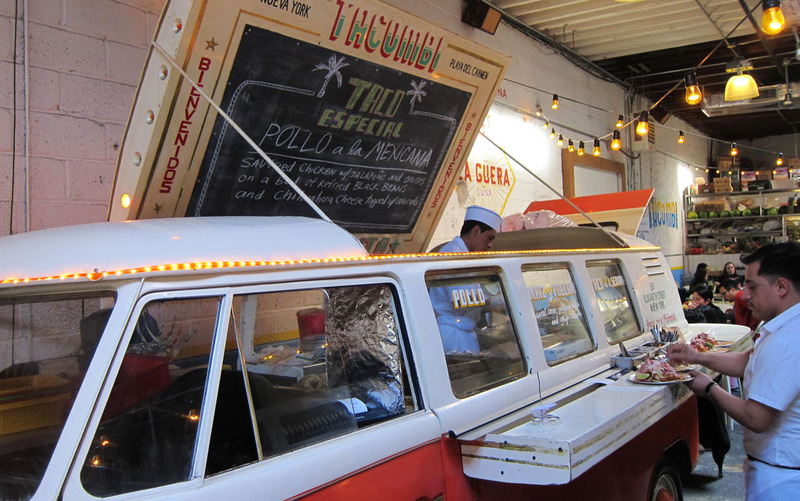 You get it … taco + combi = Tacombi! For all you Londoners Tacombi has a similar vibe and ordering system at dinner to the Wahaca chain, in that you circle in pen what food you want on the menu. Similar too are the portions sizes. Rather than stuffing your face with one huge burrito the menu allows you to order small portions of tacos (two soft-shelled corn tacos layered upon each other), therefore making it easier to share as well as giving you the opportunity to try more tasty fillings. There’s also a wide range of vegetarian options on the menu. The guacamole ($12!) is creamy and full of flavour. Pitches of sangria and Mexican sodas are sweet and delicious. Although the feel of the restaurant is ‘roadside stand’ unfortunately it does not have food cart prices. I guess it depends on how hungry you are though. Each taco costs about $4. So if you order, say four or more the bill can start to escalate without you realising (so can the pitches of white wine sangria). Tacombi’s staff however, suggest that three tacos should be enough to fill you up. 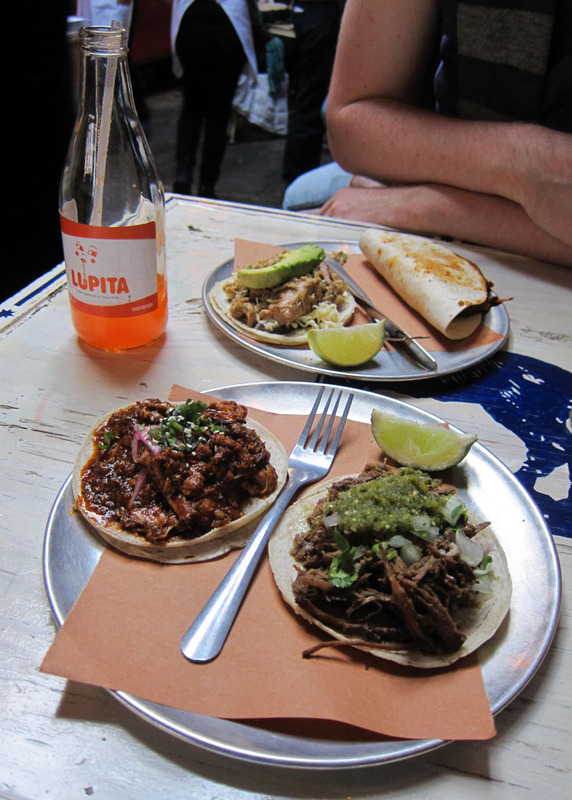 Enjoy Tacombi for it’s fun and laid back atmosphere, super friendly staff and tasty tacos. No reservations. Walk in service only. Fried chicken is big business in New York! So big in fact, that walk down any given street and you will see a plethora of menu boards boasting a dish of crispy, fried chicken. 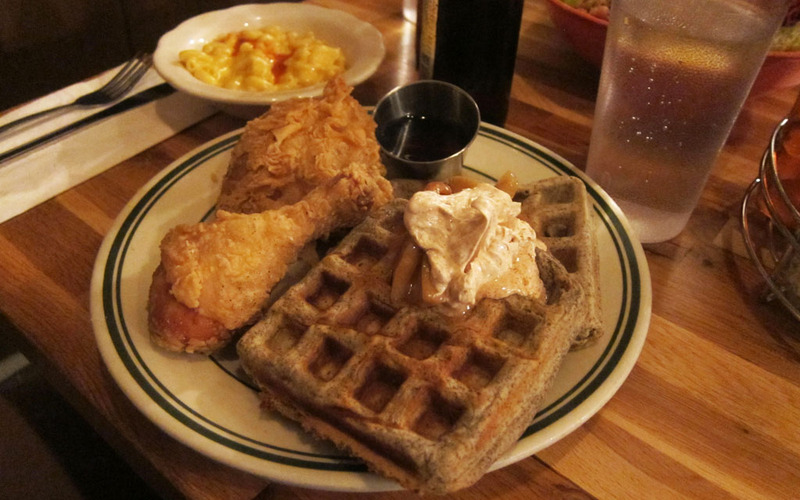 Gone are the days when fried chicken was thought of as simply a greasy, fast-food option. 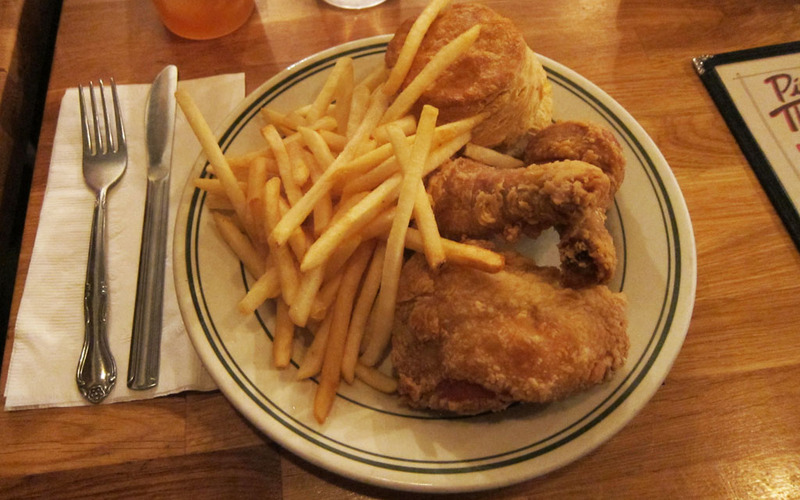 Now fried chicken has become somewhat of a gourmet delight, and has made its way into some of New York’s top kitchens. Of course the calories are just as high and unforgiving but wow, how these restaurants have taken the Southern states notion of ‘comfort food’ to a whole new level. A dangerously addictive level. Having eaten at my fair share of fried chicken places (could be the reason my jeans are getting tighter), Pies ‘n’ Thighs in Williamsburg still ranks as one of the best. The chicken, which is prepared in an open kitchen has a real home cooked taste to it, as well as an appropriate price tag. As the name suggests Pies ‘n’ Thighs specialises in just that – pies and thighs. What that means for diners is that they’re not only spoilt for choice when it comes to how they want their fried chicken served but also with the selection of home baked pies. Yum! The menu is full of mouthwatering Southern staples and sides: chicken and waffles, pulled pork, fried catfish, corned beef hash, homemade buttermilk biscuits, cheese grits, hush puppies and more. It would be a great shame not to order some sort of fried chicken dish at Pies ‘n’ Thighs, so I recommend ordering it in a Chicken Box (3 pieces of chicken, a biscuit, and a side). Trust me, you will not be disappointed. The chicken is crisp, succulent and perfectly seasoned. I also suggest drizzling some honey on the chicken (best not to calorie count), as the saltiness of the fried chicken and the sweetness of the honey makes for a ridiculously good combination. 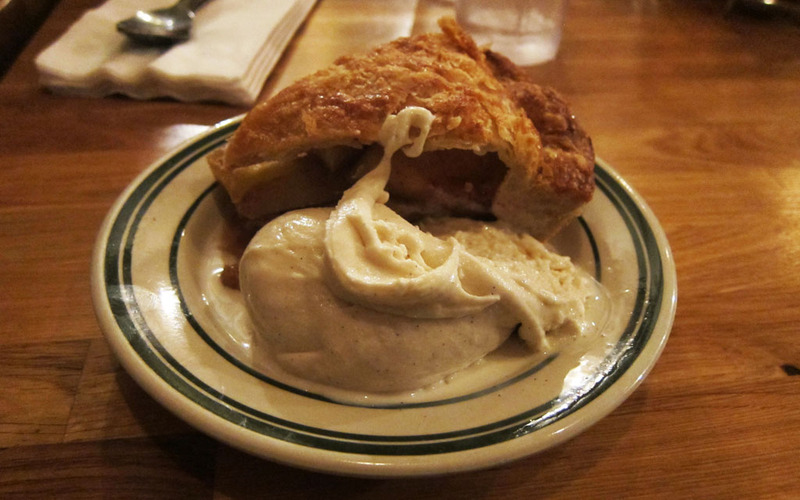 The only thing that comes close to rivalling the fried chicken is the restaurants homemade pie. I bet you’re thinking “more food”?! Yes, more! You’ve come this far, so go on, indulge a little more. Plus there is always room for pie. There are classic flavours such as, apple, pecan and sour cherry, as well as a few house specials: banana cream, coconut macaroon and choco peanut butter crunch. For me, the apple pie with its super flaky crust, is the winner. It is especially good when served with a huge dollop of vanilla bean ice cream. In addition to the finger-lickin’ food, the casual atmosphere of Pies ‘n’ Thighs is also worth mentioning. The vibe is relaxed, the wait staff are laid back and the background music funky. As you can imagine Pies ‘n’ Thighs is an incredibly popular place. Devoted locals, along with diners who have travelled from afar turn up in their droves to taste the delicious fried chicken. While there is seating in both the front and back, Pies ‘n’ Thighs is still not an overly huge place, so it is likely there’ll be a wait for a table. If you are told there is going to be a wait, I propose that you head across the road to the Dram for a quick drink. However make sure you return to the restaurant with plenty of time to spare. You don’t want your table to be given to someone else and you definitely don’t want to miss out on the fried chicken! What a great site is jesstours it made me feel like jumping on a plane to new York to taste all those yummy cakes and pies. Thank you! Yes, a big part of living in up in NYC is eating your way through the city! 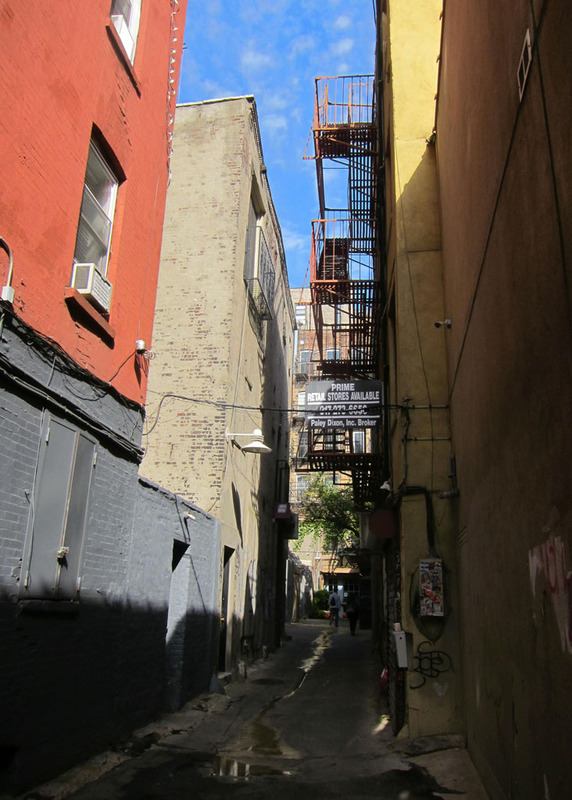 After stumbling upon Freeman Alley whilst walking the streets of the Lower East Side earlier this year, Freemans restaurant and bar (which is tucked away at the end) had remained on my to do list for many months. That is until Nick and I went for a weekend brunch one sunny Sunday. 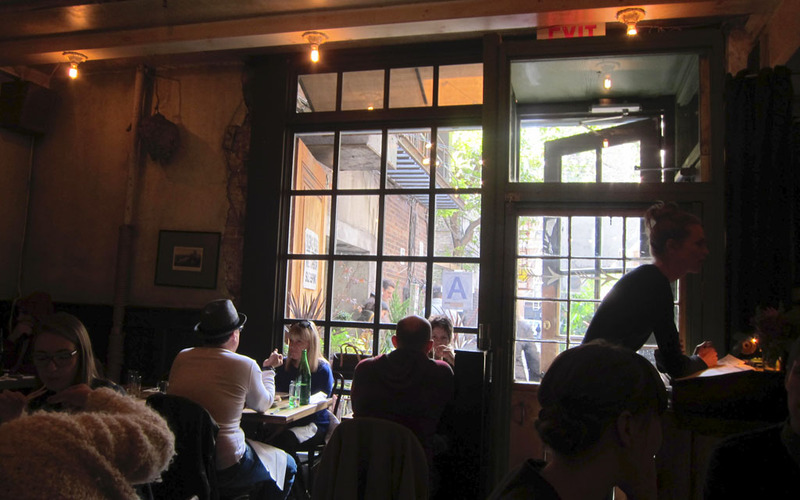 Apart from being one of the more pleasant things to find in a New York alleyway, Freemans is an enchanting restaurant, where the meals are delicious and plentiful, the atmosphere calm and inviting and the service friendly and attentive. With the restaurants hide away entrance it is easy to walk straight past. So make sure you keep your eyes peeled for the Freemans blackboard which is located at the beginning of the alley on Rivington Street. 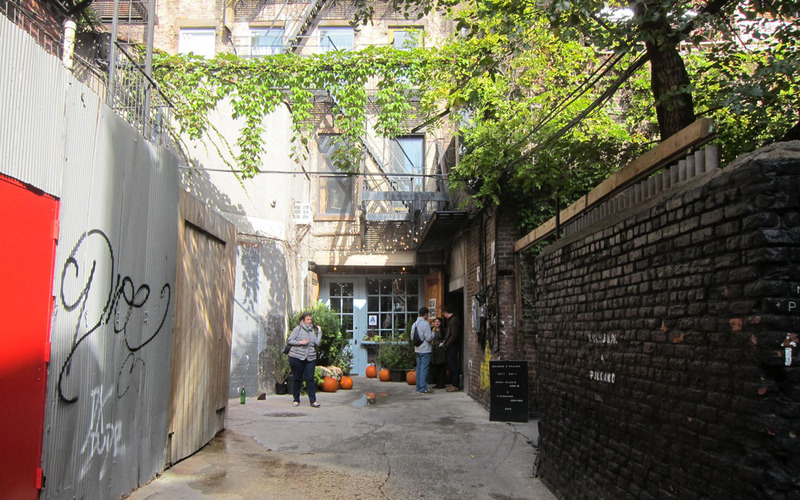 Follow the alleyway to its end and there underneath a series of strung up fairy lights and potted plants you will find the restaurant’s entrance. The main door to Freemans opens to a charming, warmly lit space, where individual tables fill a series of adjoining rooms. Diners have the choice to sit at a table or pull up a stool at one of the two bars. Weathered furnishings give the restaurant a rustic feel. As do the pressed flowers, antique paintings and assorted taxidermy that have been tastefully appointed to the walls. Like the décor the rustic theme extends to the menu. Dishes include: devils on horseback, buffalo pork ribs, herb roasted chicken, marinated and grilled prawns and many more. Indeed Freemans prides itself on seasonal, Early American and simple dishes, which are “inspired by Old World traditions”. 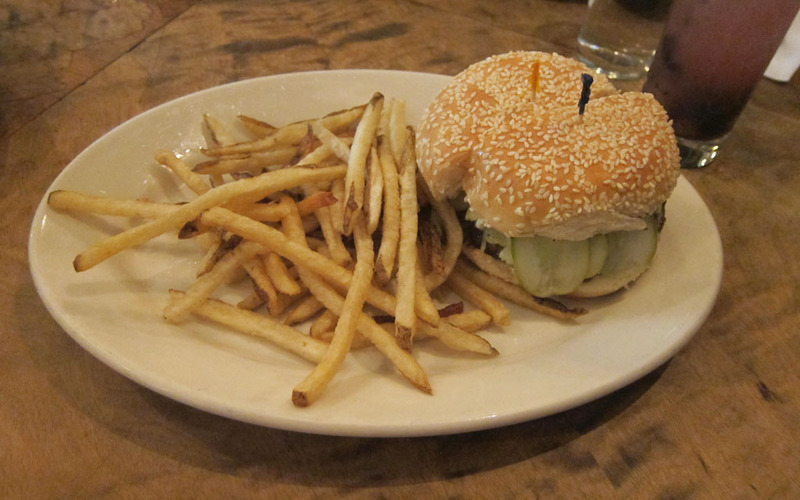 Despite the wonderful array of meals on offer I chose the Freemans Piedmontese Cheeseburger. Cooked perfectly and adorned simply with a thick slice of American cheese, lettuce, onion and tomato it is mouthwatering good! Freemans also has an ‘ice cream of the day’, which I highly recommend indulging in – especially if the flavour is choc malt. Oh my it is good! 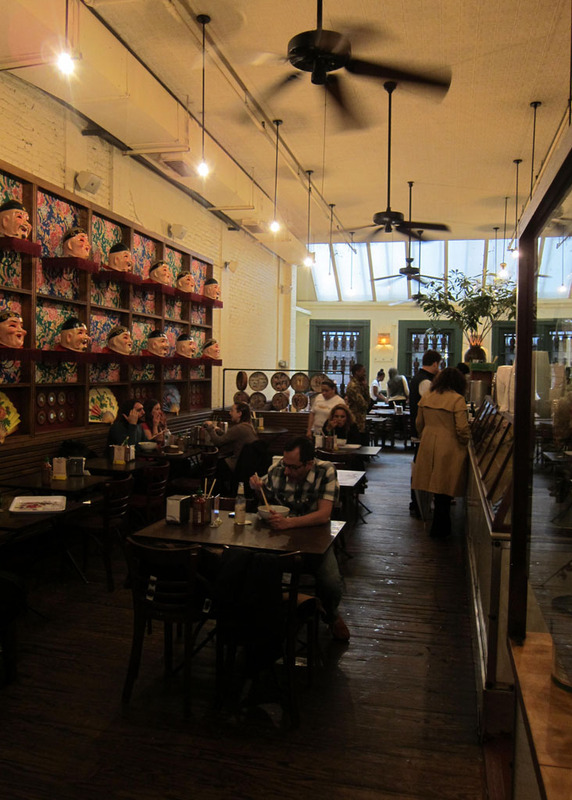 Serving lunch, dinner and weekend brunch Freemans is an extremely popular food option in the Lower East Side. Nick and I turned up at midday on a Sunday and were incredibly lucky being seated straight away – practically unheard of! If you’re a walk-in, go expecting a wait of about 30 minutes or so. 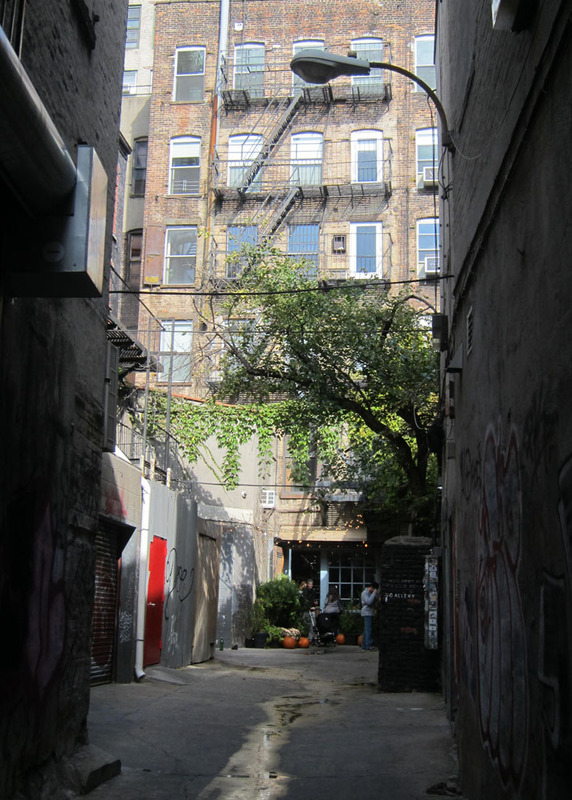 Hidden gem in the Lower East Side. Reservations for groups of 6 or more.